The Front End Servers in an Enterprise Edition pool are organized into upgrade domains. These are subsets of Front End Servers in the pool. Upgrade Domains are created automatically by Topology Builder. When you upgrade servers, you must do so one Upgrade Domain at a time. Bring each Server in one Upgrade Domain down, upgrade it, and then restart it before you move on to another Upgrade Domain. Be sure to keep track of which Upgrade Domains and Servers that you have upgraded so far. 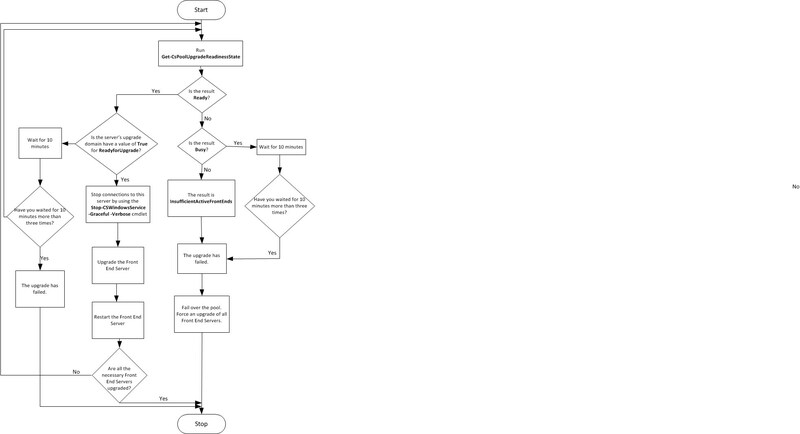 Use the following flowchart diagram when upgrading each server. If the value of PoolUpgradeState is Busy, wait for 10 minutes, and then try Get-CsPoolUpgradeReadinessState again. If you see Busy for at least three consecutive times, after waiting 10 minutes in between each attempt, or if you see any result of InsufficientActiveFrontEnds for PoolUpgradeState, then there is an issue with the pool. If this pool is paired with another Front End pool in a disaster recovery topology, you should fail the pool over to the backup pool, and then update the servers in this pool. For details, see Failing over a pool in Lync Server 2013. If the value of PoolUpgradeState is Ready, go to step 2. Stop new connections to the Front End Servers you are going to upgrade by using the Stop-CsWindowsService -Graceful -Verbose cmdlet. If you are performing these server upgrades during a scheduled server downtime, you can run this cmdlet without the ‘-Graceful‘ parameter, as follows: Stop-CsWindowsService. This will immediately shut down services, without waiting for all existing service requests to be filled. Upgrade the servers associated with this the Upgrade Domain. Restart the servers, and make sure they are accepting new connections. Repeat Steps 1 and 2 for each other Upgrade Domain in the pool, until all Front End Servers have been upgraded.